I think I’m done with bioinformatics. My current research area seems to be located somewhere between systems biology, theoretical biology and information/complex systems theory. I hope to build on Dawkins work, deal with emergence in biology and study subtle effects in biological systems. While I’m not sure if I will have anything interesting to show ever, I don’t have energy to do yet another project which involves programming/web interfaces/dealing with data/annotations/modelling etc. I’m done with analytics, time for synthesis :). Last year I wrote a post dreaming about small non-profit contract research organisation. This model of Research-as-a-Service has materialized in a virtual research institute which we have finally launched few days ago (materialized in something virtual, sign of times? 😉 ). The setup is quite simple – the institute gets a project (or applies for such) and then it searches for researchers/institutions/freelancers which are willing to subcontract parts of the project. We have outsourced not only research part, even money gathering (writing grants, etc.) is done by external company. The setup is quite flexible and pretty transparent – for example, we may represent somebody’s rights, but no intellectual property is owned by the institute. Why such institution? We become a single point of contact for a large and diverse group of scientists, which are willing to do some research for real money but don’t have time and energy to hunt for gigs by themselves. While I have an academic job, I’m in the middle of transition from being a freelancer, to being a jobs provider for freelance scientists. More on that in some other post. I plan to spend way more time on advocating open science (all of its flavors), but… in Polish. This step is out of large frustration that even prominent figures in Polish science have no idea about changes in the science internet-aware researchers are watching and creating. Knowledge about even basic things like Open Access is dramatically low in Poland (a number of people here equals OA with low quality publications which have not been peer-reviewed). With few friends, we have a number of projects in the pipeline (for example, we hope to launch a nation-wide, created by professionals promotional campaign – bilboards, TV commercials etc. – for open science). If any of these actually works, I will let you know if we have any measureable success 😉 . I feel like screaming “Labels, labels, labels, all the way!” when facing stiff schemas of what scientists “is” or what artists “is” etc. It’s a hard task by itself to integrate multiple passions and multiple interests into a coherent structure. I don’t need another set of issues because of labels people attach to seemingly creative professions. But limiting myself only to topics consistent with the image of an online scientist became even more frustrating. Therefore expect that this blog (or any other venue I choose to express myself) is going to become a lot more diverse in topics and form. The thing is, all creative thinkers use some kind of analogy. At the artistic end of the scale these analogies tend to be loose, suggestive metaphors. At the scientific end of the scale we build mathematical models. But in between come many shades of analogy, some more concrete and some metaphorical; some symbolic and some more touchy-feely. The trick, of course, is to be able to shift freely up and down the continuum as required. Not all artists or scientists can do this, sadly. Many artists are unable to anchor their thoughts in reality and many scientists are too scared to let go of certainty. (…) I don’t think particularly verbally when I’m doing research. Not visually either. Instead, it’s a mishmash of spatial, kinesthetic, visual and linguistic; very, very hard to describe. In any case, I don’t think I fit your description. I suspect a lot of theoretical physicists don’t. And actually I could end this post here, as these quotes nicely complement each other. However, there’s one more thing I wanted to add. After noticing how limited my thinking patterns are, I suspect that there’s a lot of mental barriers for creative thinking in sciences, that are “inherited” during the training process (mainly the PhD studies). There’s quite a lot of “outside” barriers too (see brilliant post by Jean-Claude on ego-less science), but my feeling is that great ideas don’t appear too often because we simply rarely fall off the track to find them. The times of Ansel Adams who took some of his most beatiful photographs from or in close proximity to his car are gone – science became a crowded tourists destination with thousands of eyes looking for a good picture from exactly the same spot. I’m very happy where the topic has lead me. The whole theme of intersection between Science and Art becomes a quest for exploring limits in scientific creativity. Science & Art: what language do you use? I’ve just realized where is the important difference between artists and scientists – and probably the biggest challenge of the merging or communicating between these two areas. When we do research, we tend to think in words. When we paint, we tend to think in colors. When we compose, we tend to think in sounds. Our right hemisphere thinks in colors, images, feelings or sounds, while the left thinks almost exclusively in words/in symbols. This is of course an over-generalization, but still I think it’s very important point when discussing relations between science and art. Putting right hemisphere experience into words is so difficult task, that most of such attempts sounds like gibberish. 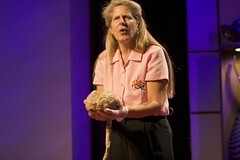 Have you watched TED talk “My stroke of insight”? Jill Bolte Taylor shared her first person observations from the stroke, which turned off her left (logical and analytical) hemisphere. While she did great job (also of not going too much into details), still some commenters were complaining about scientific quality of these observations (or that she sounded like she were on drugs, which is by the way not a coincidence). If that sound too abstract to you, consider history of discovery of benzene. Kekulé had a day dream of snake seizing its own tail – and interpreted it correctly. And I believe this is not a single example, where solution to a scientific problem presents itself to a researcher in some non-linguistic form (or rather right hemisphere sends solution to left hemisphere). However, such stories are rare for a couple of reasons: we are not usually aware of the fact that “artistic” hemisphere can “solve” scientific problems, we lack skills to identify and translate such messages, and finally it seems unprofessional to admit that we had a “vision” that led to a successful solution. I’m not sure about correctness of these speculations. It has been quite difficult to get to that point, exactly because of limits of linguistic description of the Art (I rarely can stand an artist’s statement), so it’s likely I’ve made some mistakes on the way. Therefore I would appreciate any help along the way.